Scary Treats for you to Eat!!!!! Hello everyone: I've been waiting for a chance to use my brand new SU set called Jar of Haunts, the instant I laid my eyes on it, I knew I was going to get it so, waiting for the Holiday catalog to go live was torture. Anywho, here is my card which I'll enter in a few challenges at the end of this post. Isn't this a YUMMY TREAT? I had so much fun making this card, this set is just fabulous for Halloween. I stamped the jar onto a piece of Canson water color paper with Versafine black ink and then I stamped the eyeballs, I heat embossed them with clear embossing powder then, I fussy cut the jar . I colored the greenish liquid with a neon green marker, the eyeballs with a bit of So Saffron marker and I added some Crystal Effects to the jar but, when I took the picture, the light was shinning on it and it didn't look good, but in person looks pretty cool. The spider crawling on the jar is from a bag of Halloween confetti and I think it looks almost like the spiders on the pattern paper. I stamped the slime onto a piece of very thin vellum and colored it with the neon green marker then, fussy cut it and attached it with a piece of double sided tape to the top of the jar. The pattern paper and the ribbon are from my stash, the sentiment is from the set and it's inked with different color markers, just for fun. The sentiment is so old that the name is almost gone on the wood block but I think I can kind of read the word Inkadinkado. I stamped the little spiders from the set randomly to make it even spookier. I would like to enter this card onto the following challenges. 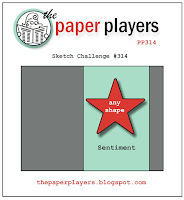 Pals Paper Arts with a sketch by Dawn Tidd. Just For Fun Rubber Stamps October Challenge "Halloween"
RETARTE #86 Anything Goes with a Halloween Twist"
Crafty Creations Challenge #325 "Halloween"
Craft Rocket Challenge Challenge #25 "Ribbon and/or Lace"
Aud Sentiments "Anything Goes + a Sentiment"
You are my Sunny Day!!!!! Hello everyone: I love little critter stamps and the Purple Onion images by Stacey Yacula are some of the cutest around. I made this card with the Frost Penguin, I think you'll agree he is just adorable. I'm linking this card to a few challenges at the end of this post. I die cut the panel of Canson water color paper with the Wonky Stitched dies and placed some washi tape on the edges and made a mask for the sun then, sponged the sky with Broken China and the Sun with Hello Honey, I stamped the image with Stazon black ink and colored it with a black Prismcolor pencil, I used SU markers for the scarf, the little feet and beak. The sentiment was inked up with markers too. The sentiment is from a Power Poppy set called Sunny Harvest and the image from retired SU set called Snow Much Fun. I would like to enter my card onto the following challenges. Crafty Girls Creations Always Anything Goes. 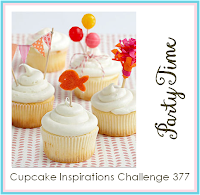 Aud Sentiments Challenge #165 Anything Goes plus a sentiment. CCEE Stampers #1639 Christmas or Winter. I also wanted to remind you that on October 4th. a new challenge blog will make it's debut. The name is The Flower Challenge and my teammates and I hope you come by and check it out and join us in the gallery. 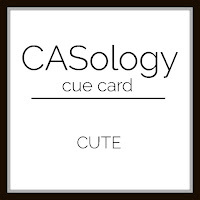 Here is a sneak peek at the card I made for this first post and I hope you come by to see the rest of it and also, the fabulous creations of my teammates. Hello everyone: Today we have a very gray and rainy morning up here in NW Indiana so I felt like making a card with some bright colors and flowers before they are gone from our gardens. I saw a card at the Muse Challenge #185 in which my dear friend Aileen Ryan from Colour and Sparkle is the Guest Designer so, I was inspired by her card to make mine. This image from the Altenew set Peony Bouquet was stamped onto a Ninah Solar White card base with Altenew inks, I made a mask with some copy paper of the outline of the big flower to stamp the small flowers and leaves. Then, I stamped the outline with Tim Holtz Antique Linen, I didn't want a hard edge on this pretty flowers. Once I stamped all the layers, I went in with my Prismacolor pencils to add some shadows and highlights on each petal, the Sentiment is from a Power Poppy set called Azaleas. This is a picture of the finished inside of my card. The sentiment is from a new Power Poppy set called Dynamic Duos: Foxglove and Ranunculus, the little butterfly from SU Papillon Potpourri. The Muse Challenge #185 Guest Muse Aileen Ryan. The Paper Shelter Challenge #266 "Blooming Days"
CAS on Sundays Challenge #92 "One Layer Cards"
Come and Get It Challenges "One Layer Creations"
AAA Cards Game #74 "Masking"
Thank you for stopping by, I always read all the comments you so kindly leave on my cards, I want you to know I appreciate this more than words can express. I also wanted to remind you that a brand new challenge blog is making it's debut on October 4th. my teammates and I hope you guys stop by to check it out, we also hope you join us in the gallery. The name is The Flower Challenge, here is a sneak peek at my card, hope you stop by to see the rest of it and also, the fabulous cards my teammates created. Hello everyone: I missed the gals at the Merry Monday Challenge over the Summer but now, they are back and I'm so darn happy. Here is a card I made for their Pink and Silver or Gray challenge, I will also link this card to a few other challenges at the end of this post. I had a ton of fun making this card, love the sweet little Winterberry Small Snowman from Purple Onion and the Stacey Yacula designs, all dressed up in pink. Since the challenge asks for Silver or Gray I decided to heat emboss this image in Silver using some Canson water color paper and then just add a bit of color with my SU markers, easy peasy. I die cut the image and the silver panel behind it with an Elizabeth Crafts nesting dies. The little snow flake and star are also die cut, I didn't have a small enough word that would fit inside the star so I just grabbed the Rose Red SU marker and hand wrote the word JOY. The pattern paper is from a retired line from Lili of the Valley, I love this one sided paper and I'm so glad I bought a whole bunch of pads and packets before they were gone for good, sigh!! Oh, I also embossed the pink panel with a snowfall embossing folder. The sentiment and sweet little mug of goodness are from a retired Flourishes set called "Sweets of the Season". I would like to link this card to the following challenges. 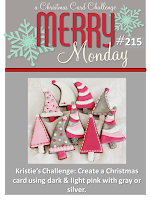 Merry Monday challenge #215 "Use Pinks and Silver or Gray"
The Paper Players Challenge #314 by Joane. 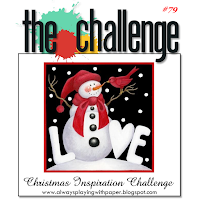 A Snowflake's Promise Challenge #29 "Anything Goes with optional theme of Seasons"
I have some very exciting news to share with you. My good friend Aileen from Colour and Sparkle asked me to be part of the Designer Team for a brand new challenge blog called The Flower Challenge . I'm super excited and totally thrilled to be joining her and my new and amazing teammates on this fantastic Journey. This challenge will be all about FLOWERS and that is right up my alley, I think I have more flower stamps than any other kind so I know I'm going to have so much fun making my cards to share with you. So please, go to the challenge and click on the tab "Design Team" so you can see who we are and learn a little about each one of us. Then, on October 4th. please join us in the gallery, we would love to see your creations there. Hello everyone: Now that Autumn has officially arrived, I'm loving all the hints of color I can see outside my craft room window, those trees in my backyard are starting to show some of the awesome and gorgeous colors of this Season. I made this card inspired by it and I will link it up to a few challenges at the end of this post. This image is from a set by Power Poppy called Sunny Harvest, stamped onto Canson water color paper with Stazon black ink and colored with SU markers and an aqua painter. Pattern paper, ribbon and brad are from my stash. I wanted to make a border with some markers but I decided to do it with embroidery thread so, I just punched the corners and wrapped around the thread, it looks a bit rustic, well.....I think so. Sentiment is from the set. Here is a picture of the finished inside. Both sentiment and corner image are from the same set. Crafting When We Can Challenges #128, "use your favorite mediums", I used water color markers. The Ribbon Girl September Challenge "use any image". Fashionable Stamping Challenges #115 "Use Autumnal Colors"
Pile it On Challenge #117 "Autumn Colors"
613 Avenue Create Challenge #189 "Anything Goes with optional twist of colors of the Fall"
Thank you so much for stopping by, until next time, happy stamping. My dear friend Aileen from Colour and Sparkle asked me to be part of the Designer Team for a brand new challenge blog called The Flower Challenge. I'm super excited and totally thrilled to be joining her and my new and amazing teammates in this fantastic Journey. This challenge will be all about FLOWERS and that is just right up my alley, I think I have more flower stamps than any other kind so, I'm going to have so much fun making my cards to share with you. So, please click on the tab "Design Team" to see who we are and learn a bit about all of us and then, on October 4th. we all hope you join us in the gallery, hope to see you there!! Hello everyone: This week the new challenge over at SHOPPING OUR STASH is all about FRUITS AND VEGGIES so we want you to dig out your images of either one and join us in the gallery. One of my favorite fruits are Strawberries so I chose this image form an old Flourishes set called, what else, STRAWBERRIES.....Here is my card. I stamped this image onto a panel of Canson water color paper with Stazon black ink and colored it with SU markers and the aqua painter, I had to put several layers of Real Red ink to achieve this shade for the strawberries. Now, from time to time I like to mix the old with the new to get the look I want for my images so in this case, I very carefully inked and stamped the two little bees from the Power Poppy set called Foxglove and Ranunculus Dynamic Duo, it was a bit tricky since this stamp is quite big but with my MISIT I was able to position my panel just right and stamp this hard working, busy gals. I just love this chubby little bees and I think they add a very sweet detail to this image. Here is a picture of the finish inside of my card. The sentiment and the basket of strawberries are from the same Strawberry set, the frame around the sentiment is from another Flourishes set called "Country Charm". Thank you for stopping by, for more inspiration, be sure to stop by my teammates' blogs and see their awesome creations. Hello everyone: Do you have a box or a drawer or a closet full of ribbons that seem to keep growing no matter what??!!! well I do, and I haven't even bought any spools lately, it's just the ribbon I've accumulated over the years that it's just staring at me every time I come into this room. When I go to the craft store to get card stock or ink I purposely avoid the ribbon sections although at this time of the year, they are there, on my way, as I walk towards to paper section of the store, trying to look away. When the Holidays are approaching it's almost impossible to resist buying ribbon, it's just so beautiful but, as much as I like it, I don't use it nearly as often to make any kind of dent in the amount I have already. That's why the new challenge over at RETRO RUBBER is great for us ribbon collectors because we want you to use ribbon in your cards. Here is mine, I even made a double bow, but my stash of ribbon kind of looks the same, sigh!! This image is from a retired Stampin Up! stamp set called "Blooming Beautiful" that made it's debut in the 2008 Occasions Mini, it's one of my favorite images. I stamped it onto a piece of Canson water color paper with Stazon black ink and colored it with SU markers and the aqua painter, the darker centers of the Pansies are done wit Prismacolor pencils. The pattern paper is from a retired line from Lili of the Valley, the ribbon and bow from my stash. For even more inspiration, hop over my teammates' blogs and see their amazing creations. Please don't forget that your stamps MUST BE AT LEAST ONE YEAR OLD, make sure you tell us their age or at the very least, how long you've had it and also, please limit your challenges to 10 including ours. Now, a good place to find out the age of your SU stamps is Splitcoaststampers, go to the gallery and all the stamps are listed there in alphabetical order. Another place is Pinterest, if you know the name of your stamp set, you can see there when your stamps were used by visiting the blogs of the people who made the card.